This May Flowers I Spy is the perfect introduction to spring for your preschoolers! Practice counting, matching, and visual discrimination while building language skills to familiarize them with words that they will be hearing during the spring season. 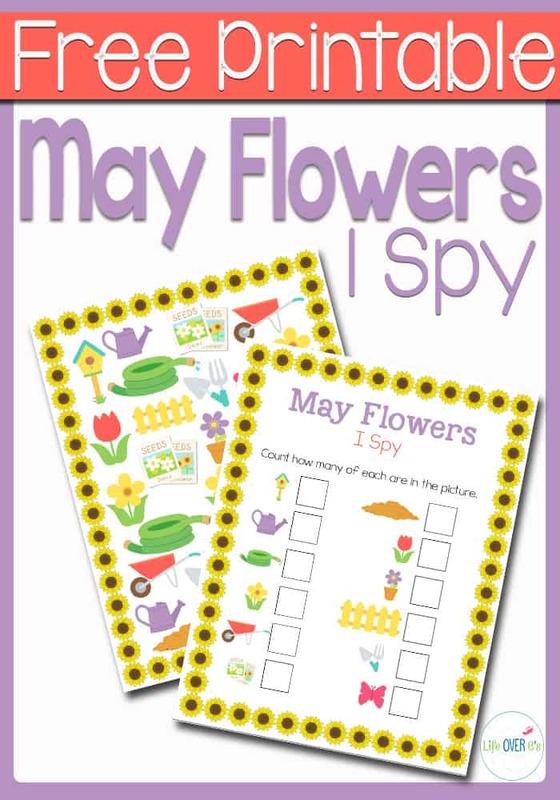 The May Flowers I Spy is perfect for using at home or school for some fun themed counting practice. To prep: Print the I Spy picture and checklist. Laminate the picture to make it more durable if you plan to use it with more than one child. You can also slip it into a plastic page protector if you don’t want to laminate. To use: Have your child count how many of each picture that they find and write the number in the box on the checklist. Just like the Christmas, Thanksgiving Dinner, Apple Orchard & Pumpkin Patch I Spy, this can be print and go if you want it to be. Otherwise, you can laminate it to use with more than one student or in more than one setting, so that you don’t need too much colored ink. To help the child keep track as they count, it may be helpful to cross off each picture as it is counted. Otherwise, young children may count the same pictures multiple times. This season have some fun with this May Flowers I Spy!